Hailing from Geneva, Bambi Deluxe has been haunting Zurich`s underground scene for many years. She has among others co-organised the parties of night-mythical reputation at the squat Club Rüdigerstrasse, and cultivates an alternative vision of living in occupied places promoting community spirit and rejecting materialism in the centre of capitalism and consumption that is Zurich. Being found behind the decks at both illegal and legal parties, she brings together Electro and Techno in a particularly rocking manner, drawing inspiration from Old School Hip Hop and Funk. She actually work as studio manager in an important gallery in Zurich. 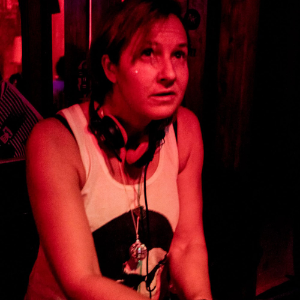 She played DJ-Sets at Les Belles de Nuit Festivals 2013, 2014, 2015, and co-lead the panel talk at Les Belles de Nuit Festival in 2014.